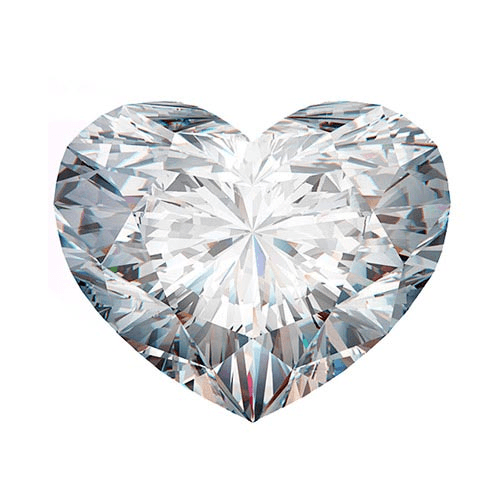 Of all the diamond styles you see in jewelry stores and bridal magazines, the heart cut diamond is one of the rarest. This uniquely sweet and feminine cut has been a part of diamond jewelry design since the 15th century, yet it has never reached levels of popularity like the round or princess cut diamonds. Recently, however, heart shaped diamonds have seen a resurgence, possibly due to a few high-profile stars, like Lady Gaga and Nicki Minaj, sporting the cut in their own engagement rings. 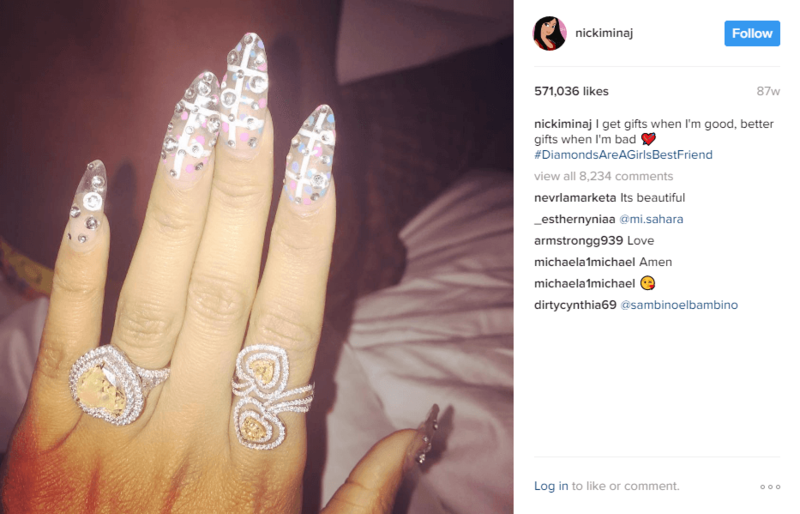 Nicki Minaj’s showed off her heart-cut diamonds on her Instagram. It’s no wonder that these ladies opted for such a unique shape; this diamond is playful, romantic, and original all at once, perfect for the bride who marches to the beat of her own drum. Heart cut diamonds are considered “fancy cuts,” which means they are a bit more difficult to create. A heart cut diamond has between 57 and 59 facets, which gives the stone a significant amount of fire and brilliance (that’s diamond-speak for “sparkle”). The skill of the cutter is absolutely critical when you’re buying a heart shaped diamond, otherwise you may not see all the beauty that this particular shape has to offer. 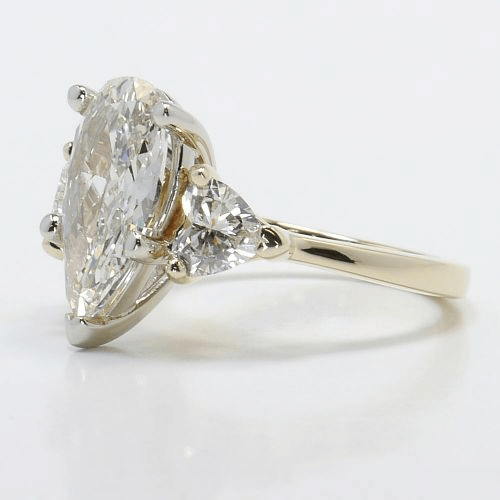 When you’re looking at engagement rings, with their gorgeous side stones and other embellishments, it can sometimes be difficult to spot flaws in your center stone. On the other hand, inspecting loose diamonds gives you a clear picture of the quality of a stone. Are there inclusions in the diamond? Does it sparkle in natural light? Does it have the ideal dimensions for a heart cut stone? Does the ratio of the length and width give you the specific heart shape look you want? When you buy a loose heart cut diamond instead of a finished product, you’ll be more likely to find the quality stone that the love of your life deserves, and you’re more likely to find it at a better price. As we mentioned early, you don’t see many heart shaped diamonds when you’re walking down the street. But if your heart is set on this unique cut, you might be tempted to buy the first ring you come across simply because you finally found a ring that has this center stone shape. But when you’re dealing with a special diamond shape like a heart cut, you need to make sure that your investment is protected, and that your diamond is set properly so that it won’t chip, fracture, or fall out. By buying your heart cut diamond loose, you can work directly with a jeweler to ensure that your diamond is in a setting that will not only keep your stone safe, but will also highlight its exceptional beauty. Given that the heart diamond is so rare, when you do spot it, it’s usually on the hand of a woman who’s a rare find, too. This is another reason to buy your heart cut diamond loose and work with a jeweler: you can get creative with the setting. 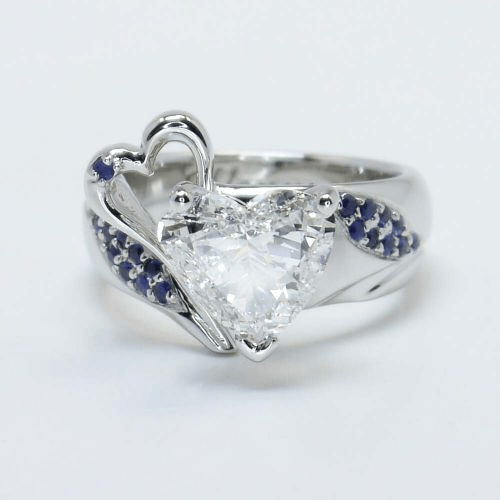 Working with a jeweler to create a custom setting can be a lot of fun, and it’s a great way to give the woman you love something as special as she is. With your loose heart cut diamond ready, you can design a band that suits her personal style. You can highlight a solitaire heart diamond with a unique band style, like the split shank, or accent it with colorful side stones. Heart shaped loose diamonds also make for great side stones themselves! The possibilities are endless—and who wouldn’t want the chance to make something beautiful for the woman they love? 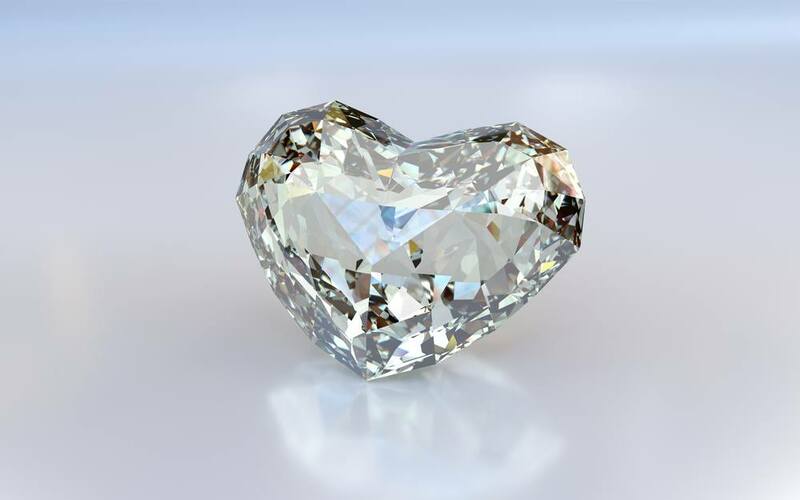 As you continue your search for the perfect diamond, don’t let the heart shaped diamond pass under your radar. This beautiful stone makes for a striking symbol of love, a ring you both will love and cherish for the rest of your lives.